Today’s blogpost is contributed by one of our users: Andrea Mazzini, and originally appeared on his blog. Andrea is cofounder and iOS developer at Fancy Pixel, an Italian company building web and mobile apps for iOS and Android. You can find Andrea on GitHub and Twitter. It’s been a busy year for iOS developers. We got a slew of new toys to play with: a new version of iOS, new frameworks, a new language, new screen sizes and some new hardware to put on our wrists, just as soon as we thought that watches were anachronistic. New technology is always exciting, but keeping up to date can be a daunting task when deadlines keep getting closer. Lately I’ve been taking some time off to delve deeper in these new topics and build a simple app out of it (that we are planning to open source). At the time of this writeup the app is still waiting to be reviewed, so we’re going to just focus on something that I learned in the process and that can be useful to a lot of other iOS devs: sharing data between your app and its WatchKit extension, using Realm. Realm is a great replacement for both SQLite and Core Data, it offers a quick and painless way to persist data in your iOS (and Android) app. The thing that makes it so great is the ease of use, it reduces your boilerplate code to next to nothing (I’m watching you, Core Data), keeping things at a high level of abstraction (I’m watching you SQLite) and… it’s fast. It really is a brilliant piece of software, and I urge you to checkout the official documentation if you’re in need of a persistence framework for your app. We’re going to learn how to share data between an app and its WatchKit extension, and what better way to use a sample app as reference?. I’m not a fan of TODO app demos, they always feel… unimaginative… but I have to admit that they are the perfect sample for a task like this. So, bear with me, let me introduce to you another TODO sample app: Done!, a simple TODO list where we can add items and mark them as done from our Apple Watch. 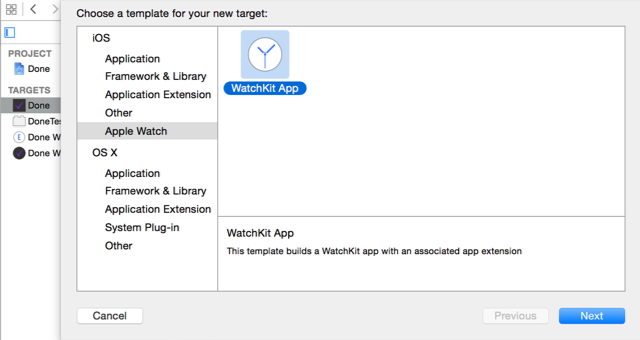 WatchKit extensions are just another target inside your app, just like Today extensions, so they are packed alongside your app, but they have their own life, and most importantly, their own bundle identifier. This means that data stored within an app is not visible to the extension and vice versa. Apple offers a way to solve the issue through app groups. App groups, like bundle identifiers, are defined by a reverse URI and they are prefixed with group.. They let you share data between your apps and are tightly bound to your provisioning profile (luckily Xcode handles their creation in your developer portal with ease). let directory: NSURL = NSFileManager.defaultManager().containerURLForSecurityApplicationGroupIdentifier("group.it.fancypixel.Done")! If you worked with Core Data in the past you should have a better understanding of my claim “less boilerplate code”. Ok, new technology, new framework, so much to learn, right? Pretty straightforward, think of it as the equivalent of a custom UITableViewCell. let imageName = entry.completed ? "check-completed" : "check-empty"
That’s a little different from what we’re used in UIKit. No delegate nor dataSource, in WatchKit we explicitly define every row before showing the table. Also, as you can see in the awakeWithContext function, we are setting up Realm as we did in the main app. As a side note, the pieces of code that are shared between the two targets (in our case, everything concerning the model) should be moved in a custom framework to avoid code duplication. For the purpose of this sample I opted to duplicate the Realm initialization and shared the model between the two targets, but in a more structured app I would definitely take the framework route. If we build and run we can add an item on the phone, and once we reload the app we’ll see the same item in the watch extension too. That pretty much covers it. Right now it’s even more apparent that even if the two apps are communicating, there’s no real sense of interaction, since we need to reload the app to see the changes. We need to somehow advertise that our watch app or our main app performed something meaningful. There are official ways to do that, and you can read more about them on this blog post from Natasha The Robot, but in this case I want to show you how a brilliant library called MMWormHole can abstract this task for us. As long as we keep a strong pointer to the token, the system fires the notification block as soon as a write transaction is committed. You can find the updated code in the sample app. As you can see it’s really easy to bootstrap a simple app for WatchKit, and thanks to a couple of great open source libraries adding persistence and interactivity is a painless effort. A big thank you to both the Realm team and Mutual Mobile for the amazing work on MMWormHole. You’ll find the source code of the demo app on my GitHub page. Feel free to leave a comment, we’d love to hear your feedback. Many thanks again to Andrea Mazzini for letting us reproduce this post from his blog. You should check him out on GitHub, or email us if you want to share a tutorial or article about Realm on this blog. Andrea Mazzini writes code primarily for iOS but sometimes for Rails. When coding gets to his nerves he unwinds by writing tech articles and drawing stuff with Sketch. You can checkout his work over at Fancy Pixel and his open source work on his Github page.